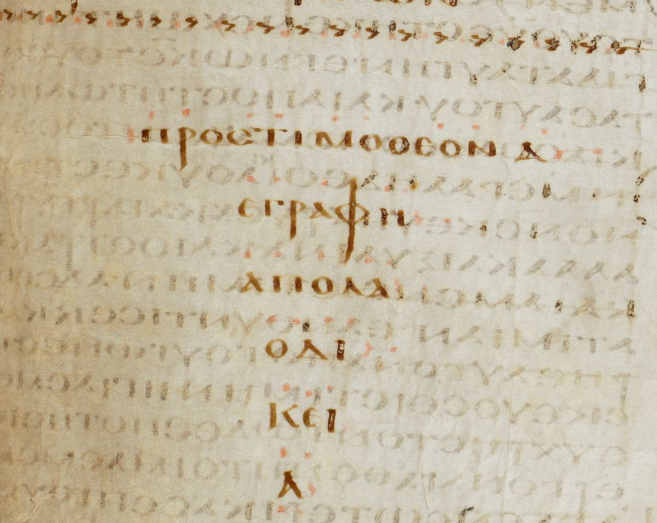 Image: The postscript to the book of 1 Timothy in the fifth century Codex Alexandrinus: "The first (letter) to Timothy written from Laodicea"
3. Quality of manuscripts - NASB The KJV was based on the manuscripts which were few in number, local in geography, and late in date. Archeology has, since the KJV, made almost all important manuscript discoveries - everything from the Dead Sea Scrolls back to the Rosetta Stone, all occur after the KJV. These new manuscripts can be found in conclusive families, based on history and geography, with standardized variations of content and recognizable progression of modifications. Today's critical texts are very broad based and careful reconstructions of the original writings, and cannot be reasonably discounted out-of-hand, nor can the published arguments of those who would demand the exclusive use of the Textus Receptus be validated, or even accepted as reasonable. To suppose that the much older, much more widely distributed manuscripts, in many languages, which have been discovered over the last 390 years are all corrupted and inferior to the sources for the KJV is incredible, to say the least. JTR Response: I begin by again noting that Stanfield says he arranged these topics “in order of significance.” In my view the issue of the text (manuscripts) from which a translation is made should be a primary consideration and not a secondary (or tertiary) concern. This issue should be addressed sooner rather than later. I also must call attention to the fact that this paragraph has a number of confusing statements, factual errors, and misleading arguments. Stanfield starts by asserting that the KJV was based on texts “few in number, local in geography, and late in date.” I assume he means by this that the actual number of individual Greek and versional manuscripts to which the KJV translators had access was limited. I have two responses: First, in fact, we do not have exact or exhaustive historical information on the individual original language manuscripts used by the KJV translators. Thus, we must have some humility in criticizing them in this area. Second and most importantly, we do know that the manuscripts they relied primarily upon were the traditional Hebrew Masoretic text of the Old Testament and the traditional Byzantine or Majority Text of the New Testament. Contrary to Stanfield’s statement, the traditional text used by the Reformation era Protestant translators generally represent the vast majority of extant original language manuscripts, cover a wide geographical area, and have an early attestation. With specific regard to the Old Testament, the KJV translators made use of the traditional Hebrew Masoretic Text. Many modern versions have adopted alternative translations of various Old Testament passages based on readings found in the LXX, the Vulgate, or the Dead Sea Scrolls, etc. For a counterweight to this trend, one should consult, however, Cambridge professor Geoffrey Khan’s A Short Introduction to the Tiberian Masoretic Bible and its Reading Tradition (Gorgias Press, 2013). Khan contends for the antiquity not only of the Masoretic Hebrew consonantal text but also the Masoretic pronunciation and reading tradition. He states, for example, “Contrary to a view that is still widely held today, the reading tradition was not a medieval creation of the Masoretes but was an ancient tradition that the Masoretes recorded by their notation system” (p. 47). Stanfield also makes reference to the significance of archaeological finds that have happened since the KJV was completed. He mentions two such finds in particular. He first mentions the Dead Sea Scrolls (discovered in 1947) which do indeed have importance for translations of the Old Testament. Many of these texts found at Qumran, in fact, support the traditional Hebrew Masoretic Text, while others provide alternative readings to the traditional text which have been adapted in some modern translations of the Old Testament. Traditionalists, however, continued to advocate the superiority of the traditional Hebrew Masoretic Text, the same text used by the KJV translators. The Dead Sea Scroll discovery has had no significant impact on the translation of the New Testament. Secondly, he mentions the Rosetta Stone (discovered c. 1799 and translated in the early nineteenth century). This mention is a little harder to understand. The significance of the Rosetta Stone is the fact that it provided a key to translating ancient Egyptian hieroglyphics. It has had relatively no impact on the translation of the Bible. The next comments which Stanfield makes are particularly confusing. He states: “These new manuscripts can be found in conclusive families, based on history and geography, with standardized variations of content and recognizable progression of modifications.” He seems to be referring here to the division of Greek New Testament manuscripts into genealogical families. This statement is confusing, because one might think he is referring to the Dead Sea Scrolls and the Rosetta Stone, but these have absolutely nothing to do with the New Testament Greek manuscripts. Furthermore, the genealogical approach to text criticism, popularized in the nineteenth and twentieth centuries by scholars like Westcott and Hort who advocated for the superiority of the so-called “neutral text,” has largely been abandoned in contemporary post-modern approaches to text criticism. The book to read here is David C. Parker, Textual Scholarship and the Making of the New Testament (Oxford University Press, 2012). Stanfield proceeds to make reference to the superiority of today’s modern critical text. He refers to them as “careful reconstructions of the original writings.” There are several problematic issues with his approach here. First, it reflects the modern idea, popularized by the likes of B. B. Warfield and Bruce Metzger, that the text of Scripture has been woefully corrupted and must be reconstructed by modern scholars. Evangelicals like Warfield introduced the notion that the Bible was without error in its “original autographs” but corrupt in the preserved apographs (copies). As Theodore Letis has pointed out, however, this view essentially suggests a Platonic idea of the text of Scripture. It also represents a departure from the doctrine of Scripture found in Reformed confessions, like the Westminster Confession of Faith and the Second London Baptist Confession of Faith (1689). Contrary to the modern approach, the Protestant and Reformed Fathers held that the Bible had been infallibly and providentially preserved in all ages through the extant copies. They did not advocate the scholarly reconstruction of an elusive original autograph. Again, their focus was preservation not reconstruction. Second, the approach Stanfield advocates (seeing the goal of text criticism as the reconstruction of the original autograph) has been largely abandoned by modern academic text critical scholars who see the attempt to reconstruct an original autograph as not only impossible but inadequate. Modern text critics no longer speak of trying to get back to the “original text” of the Bible. Instead, they prefer to speak of many “living texts” of the Bible, each of which is as valuable as any other, whether they represent orthodox or heterodox readings. Stanfield concludes with a particularly negative assessment of the affirmation and defense of the traditional, received text of Scripture. In his opinion, such a view cannot be validated or “even accepted as reasonable.” To the contrary, however, a consistent and reasonable defense of the traditional text of the Reformation Bible can be defended and certainly should not be rejected without due consideration of its merits. Why should traditional Christians and faithful churches abandon the text of the Reformation in favor of the text of the Enlightenment? Thank you for your comments and for the information presented here. I have found that many who promote the Critical Text of the New Testament confuse Old and New Testament issues. They also tend to make wild assumptions, either of their own making or some other teaching they heard. It is amazing what is still promoted out there. One that comes to mind is the story that Bruce Metzger told about the addition of 1 John 5:7. He claimed that Erasmus had a scribe named Roy or Froy to make up the text so that he could add it to his Greek text. If this were true, it would have many alarming implications concerning Erasmus and our New Testament. However, Erasmusian Scholars have debunked that Urban Legend as utterly false. Nevertheless, Dan Wallace, and James White still go around telling that story. I appreciate your honesty and willingness to present "all" of the facts, even the ones that aren't favorable to our position concerning the New Testament.